Hello, my name is Anne Laganière and I'm Manager of Environment at Rio Tinto Fer et Titane. I was trained as a geological engineer, and I've worked here for nearly 8 years. As Manager of Environment, I work with a team to ensure that all the procedures, all the projects that are carried out here, on the Rio Tinto site, comply with the applicable laws and regulations and are environmentally sound. We are also very involved in the community. Rio Tinto Fer et Titane is a leader in the mining and metals industry. We have been in business here for over 60 years, and we have 2,000 employees. Rio Tinto Fer et Titane produces titanium dioxide and iron. We are one of the top producers of titanium dioxide, which is used in plastics, paint, textiles, and paper. We also produce pig iron, steel and metal powders, which are mainly used in the automobile industry. The main raw materials we use, ilmenite ore and coal, arrive by ship at the Rio Tinto Fer et Titane wharf. Water is also essential to the metallurgical processes we carry out here in Sorel-Tracy. Water is used as a coolant and for gas treatment. Water is pumped in from the St. Lawrence. It is channelled to our various plants, then sent to our water purification plant for treatment. We have settling tanks which are used to allow particles to settle out of the water, which is then returned to the river a few metres from where it was collected. 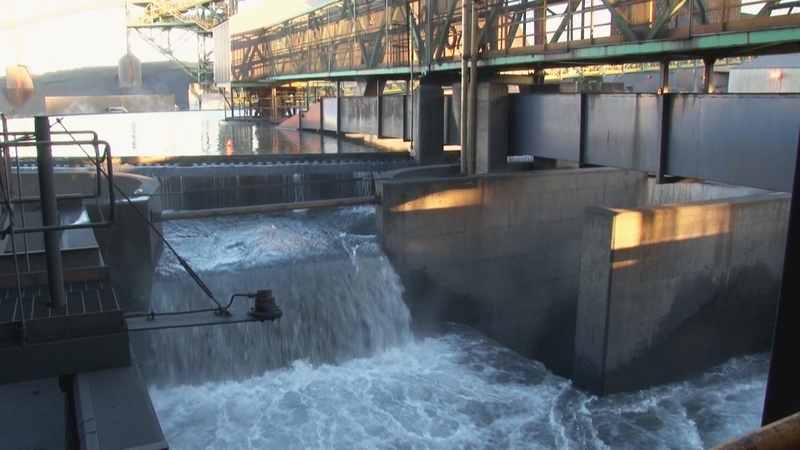 In the 1990s, we set up our water treatment plant, which allows us to remove most particles from the water. In the past few years we have done a lot of work, and made a lot of improvements. Now, the water that we pump back into the river is just as pure as when we pumped it in. In 2009, we carried out a lot of work here at Rio Tinto. We enlarged the wharf. Because enlarging the wharf meant encroaching on fish habitat, we decided to create a new habitat for fish. This project involved setting up a bay. So, in summer 2012, we worked on this bay, levelling certain parts of the site and planting many trees and a wide variety of plants. The project created a great habitat for many species of fish that live in the river; the bay serves as a spawning and feeding ground, and also provides refuge from predators. With regard to air emissions, we have carried out several major projects. We installed stocking domes to contain ore from Madagascar and finished goods. By storing these materials inside, we avoid emitting particles into the environment. Another major improvement at our metallurgical complex was the addition of a new port tower, which is used to load our products onto ships. The tower is modern and efficient, and was designed specifically for our products. It has a built-in dust extractor and a chute designed to handle the type of product we load onto the ships. This new loading method reduces dust emissions into the environment. I was trained as an engineer, and I'm passionate about heavy industry. For me, working in the environmental field is a great way to be involved in heavy industry, ensuring it is environmentally sound, respectful of the community, and complies with laws and regulations. All of that. Carrying out environmental improvement projects allows me to me grow from day to day and work with people. People here are extremely dedicated. And my role is to steer those people in the same direction. Of course, the work we do at the plant has some environmental impact, but we are constantly working to reduce that impact and the size of our environmental footprint.